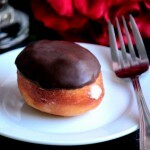 Chocolate Dipped Cream Filled Doughnuts made from scratch at home for your special Valentine! Hey! So just in case the explosion of pink and red EVERYTHING that happened to hit the shelves of every store in the world like 3 days after Christmas didn’t tip you off, Valentines Day is coming!!! Ok, running is to much work. Never mind. Now our “Valentines Day Celebration” is much like our Anniversary celebration. haha They normally involve take out and a movie from Netflix. However, this year we’ll probably change it up a bit and watch an obsessive amount of Vampire Diaries instead of a movie. After all, Valentines Day is on a Saturday this year so we can be rebels and stay up late watching mind numbing TV. We “might” go out to dinner for Valentines but it’ll be like a week after Valentines day so that we don’t have to deal with the crowds. I use to wait tables and I hated Valentines Day with a passion, it’ll be a mad house out there. I’ve gone through my love and hate phases of Valentines Day over the years (like the time my highschool boyfriend ditched me on Valentines day to go to a concert with this “guy friends” *cough cheater cough* and the times I’ve gotten flowers delivers from my awesome hubby. I know I’m jumping all over the place but let me tell you, I use to have the BEST valentines days when I was a little girl. haha My dad use to pick out the sweetest Valentines day gifts and my mom and I always got red or pink roses, candy and some other type of little gift like jewelry or stuffed animals. One year my dad bought my little brother and I these HUGE teddy bears for Valentines day, they were almost as big as we were and now that I look back on that I just can’t help but smile and laugh a little as I think about my dad going to the store and picking out these giant (and I mean GIANT) teddy bears for us and lugging them home. So let’s just assume that maybe you’re not going to be buying your Valentines a bunch of flowers and a life size teddy bear this year. Le’t just pretend that you’re looking for that perfect gift. If you’re looking for that awesome gift, I’ve got it right here. I mean I don’t know anyone that wouldn’t be super excited about someone making homemade doughnuts for them. Don’t forget that this is the 12th day of the month so of course it’s #12bloggers recipe day! 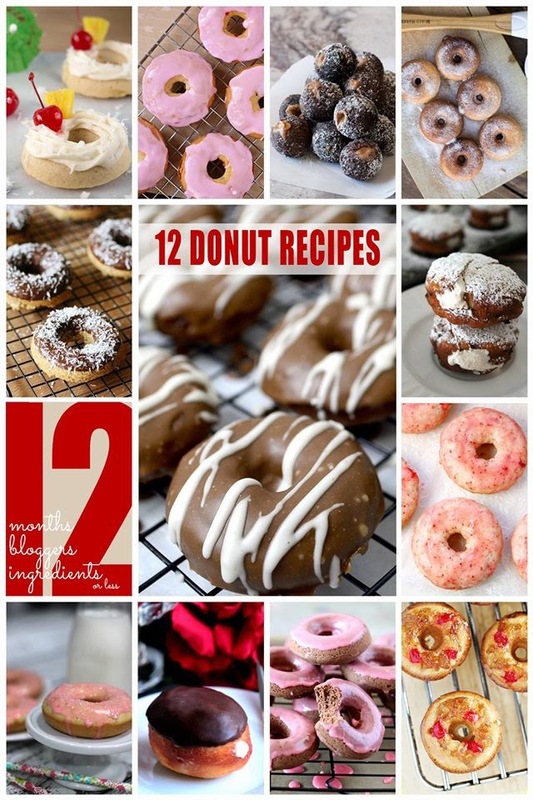 Our theme for this month is DOUGHNUTS and you can find 11 other tasty doughnut recipes below this one! 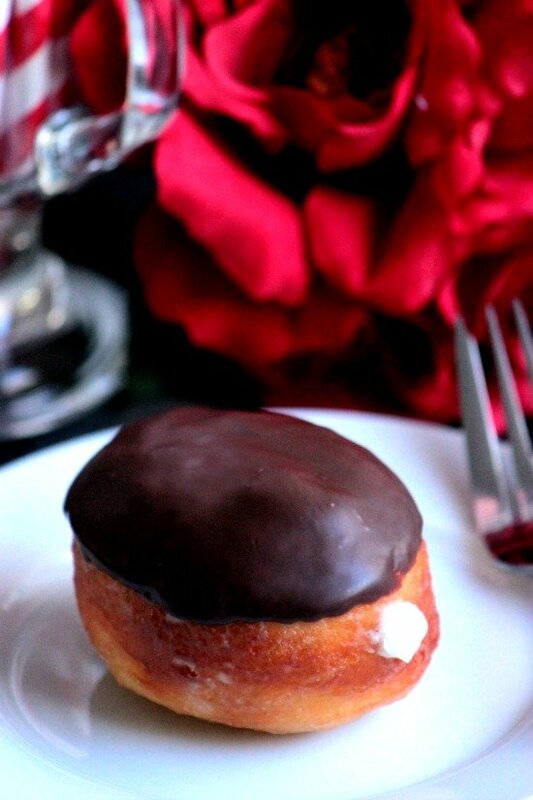 Chocolate Dipped Cream Filled Doughnuts are perfect for Valentines Day or any day of the year! In a medium bowl, mix the melted butter and powdered sugar. Use the milk to thin out the glaze. Mix well and set aside. In a small bowl, add the yeast to the warm water and set aside to rest for about 3-4 minutes without stirring. After 3-4 minutes, add the yeast/water to the bowl of a stand mixer. In the bowl, mix the yeast/water with the scalded milk, sugar, salt and butter. Mix well. Add in 4 cups of flour and mix well. Occasionally,use a spatula to scrap down the sides of the bowl as needed (when the mixer is turned off). Add in the last 4 cups of flour and mix until everything is combined. Cover the bowl with a tea towel and let sit in a warm place for 1 hour so that it can rise. After an hour, remove dough from the bowl and place it onto a floured surface.Punch the dough down and roll it out until the dough is about ½ an inch thick. Place all of the doughnuts on a baking sheet and cover with a tea towel. Let doughnuts rest for 30 minutes. Place two doughnuts into the hot oil and fry for 1- 1.5 minutes. Once that side browns, flip the doughnut and cook for another 1- 1.5 minutes. Again watch for them to get brown. When the doughnut is done cooking lay it on a paper towel lined cooling rack to cool for a moment.But before it cools all of the way, dip it into the glaze, place onto a cooling rack. Let cool. Repeat steps until all of the doughnuts are done. 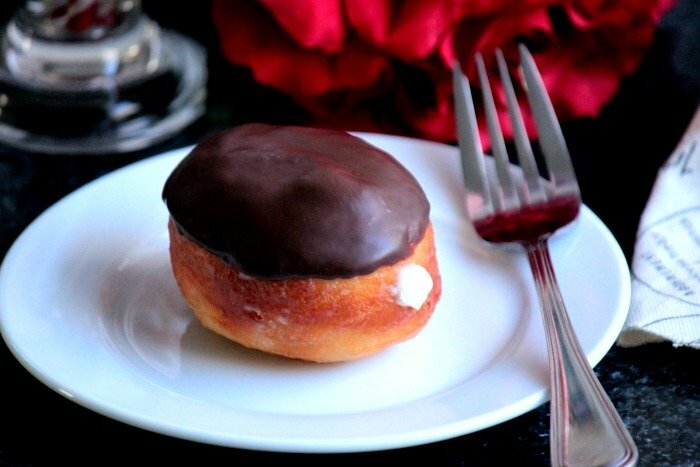 Once doughnuts are cooled, fit a piping bag with a long piping tip (like Wilton\'s No. 230 Round Decorating Tip) Fill the bag with pastry cream or vanilla frosting. Press the tip through the side of the doughnut and press the bag to fill the inside of the doughnut with the filling. In a medium bowl, melt the chocolate candy melts according to the package directions. 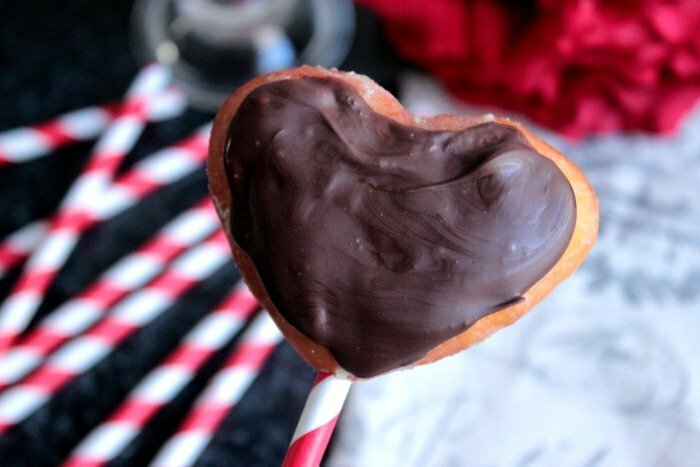 Dip the tops of the doughnuts into the melted chocolate. Set aside and let the chocolate harden. 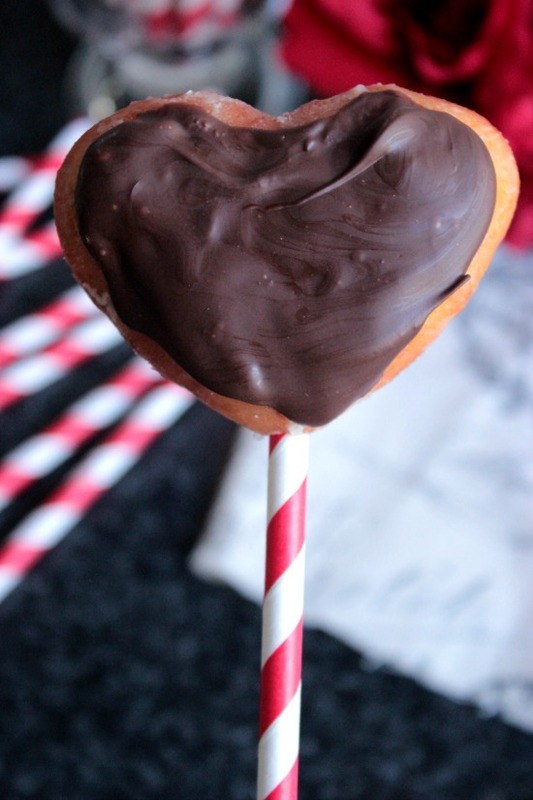 So yummy and perfect for Valentine’s Day! I agree, if they don’t like homemade doughnuts, they’re not right for you anyways! 😀 Pinning and scheduling a FB share! Super cute! I think my Hubs would love these for valentines day! These donuts look awesome, and you made me remember my Dad getting roses for my mom too, it was so sweet. We don’t do any big celebrations either. Our day tomm will consist of running errands, and later Netflix. I have to check out Vampire Diaries. Right now I”m still hooked on Supernatural and reruns of Charmed from CW. Oh yum! Now I need a doughnut! I’m finding more and more people are not huge Valentine’s day celebrators. My hubby and I like to celebrate the following weekend, as well. We don’t really celebrate v-day either. We usually exchange a card and make dinner tonight 🙂 However, if I made my hubs some of these donuts he would go crazy! 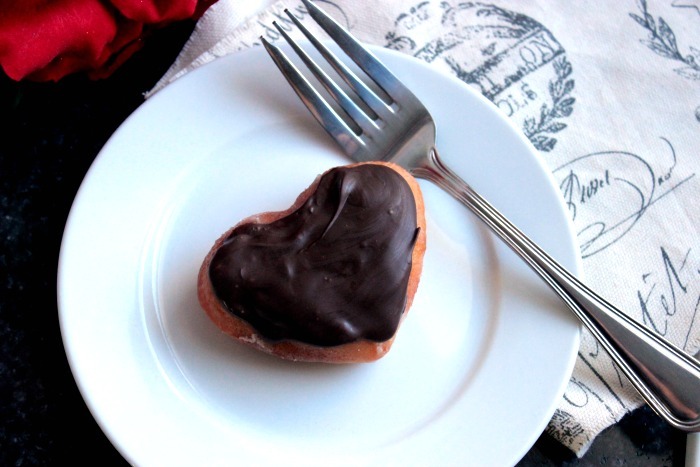 Forget the long stemmed roses for Valentine’s – I’d like a dozen of THESE doughnuts! I love that they are heart shaped – so pretty (and so tasty)! I love everything about this recipe. Chocolate-dipped? Yum! Cream-filled? Yum!! Doughnuts? YUM!! I’ve made baked doughnuts at home before, but I haven’t attempted fried ones yet! These look amazing!!! Great choice for donut month!! What a great dessert for Valentine’s Day, and such a cute touch to make them into little hearts. My husband would certainly flip for these.